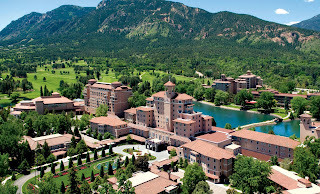 The Broadmoor in Colorado Springs is a fabulous resort in beautiful setting. The photo above is from The Broadmore web site. We called for afternoon tea reservations and learned they serve 3:00 to 4:00 p.m.
during summer months in the West Tower Lobby. from July 1 - September 23, 2016. We ordered the Julie Penrose Afternoon Tea, named for the wife of the founder. Each of us chose a tea from the selection of seven teas and two herbal blends from Mighty Leaf Tea. but all the "regular" tables were busy when we arrived. Our sandwiches were Salmon, Egg Salad, and Cucumber. Each guest had three scones, served with cream and jam. The assortment of delicate pastries were beautiful and delicious. The guys especially liked the raspberry pistachio pastry. Our server was Laura, who offered to refill our teapots with hot water. and several of her personal items. It was fun to see personal items of the special lady for whom our tea was named. What fun! I have really enjoyed reading about your travels this summer. 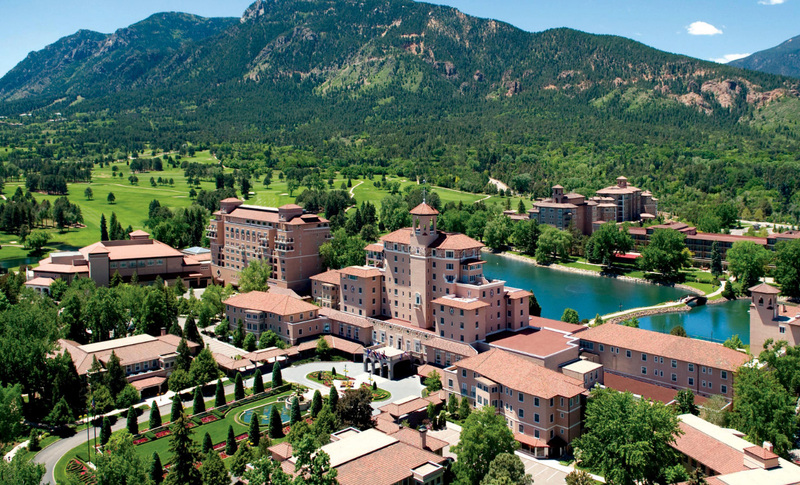 About 20 years ago, my employer sent me to a conference at the Broadmoor - what a magnificent place and a wonderful opportunity. Have a great wknd, Linda. What a beautiful place. When my youngest son was living in Denver we went to dinner at Broadmoor, but I have no Afternoon Tea experience. There are so many things I'd like to do if I ever returned to Colorado, but Jeremy's living back in Michigan now, so a visit to Colorado isn't too likely. That would be so fun. It's a beautiful hotel. My husband remembers staying there with his family many many years ago, when he was a kid. We lived at the foot of Pike's Peak back in the seventies, a magical time in my life.. When we went to the Broadmoor, the Olympic ice-skating championships were being held, and I'll never forget those beautiful Rockie Mountains cloaked in a blue-haze. Glad to hear you had such a grand time. This afternoon tea looks just wonderful. Thanks for sharing it. I love it when the teas are named after someone local! 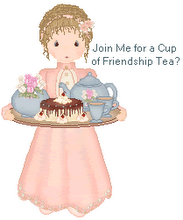 I had plans to do that back when I thought about opening a tea room. Now I figure I'll just incorporate it into my books!